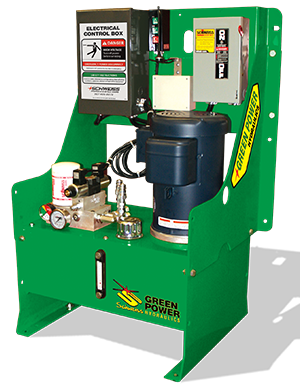 SCHWEISS DOORS HAS TAKEN EXTREME PRIDE IN INTRODUCING ITS NEW POWERFUL RED AND GREEN POWER PUMPS TO THE WORLD. From the minute you press the control button on your handy remote control, you'll be amazed at how this door functions. It's everything you want it to be and more. The unit has all the bells and whistles and comes with single or 3-phase electrical components. Easy to read psi pressure gauge, service filter and fluid temp gauges let you know that the door is always working properly and at full capacity. 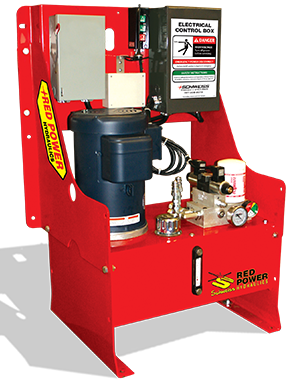 Everything is in one compact hydraulic pump unit powered by 2, 3, 5 or 10 horsepower motors to safely lift even the smallest or heaviest doors and seal them tightly. The Schweiss Safety Advantage allows the door to lock up and down or safely lower or raise your door in case of electrical failure. 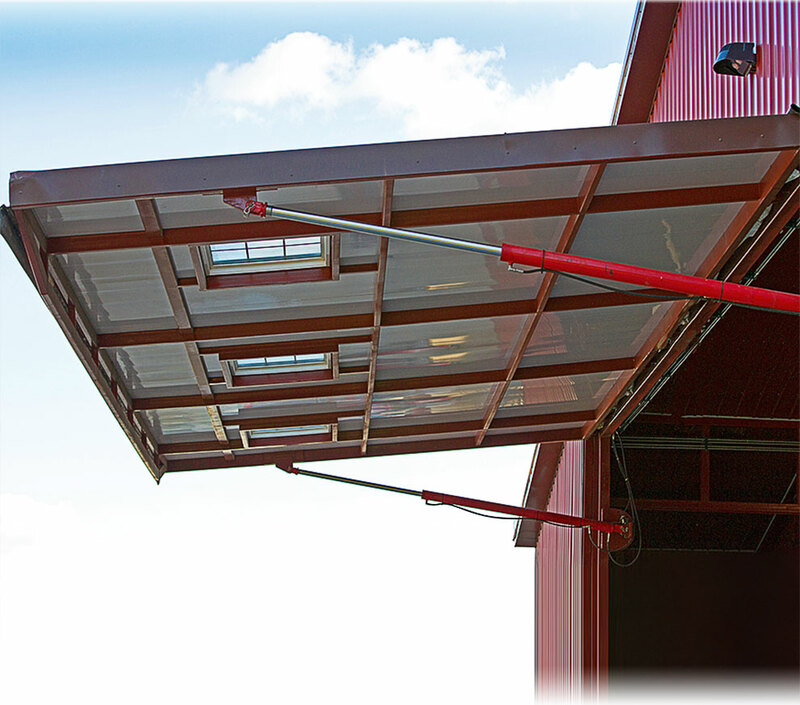 Each unit comes with a standard tractor hydraulic hookup, lower the door at any time, very handy for agricultural or industrial applications. Special designed built-in manual override allows the operator to lower the door in case of a power outage. Battery backup features use a DC battery or drill to operate the door in either direction in case of an emergency, giving you a superior backup system for your door and peace of mind. They're powerful... We're talking THE most Efficient Pumps with standard motors designed ready to lift any size door, at any time, all the time! They're Reliable... Safe, Carefully Designed Hydraulic Pumps that operate at 95% efficiency. They're Quiet... This amazingly smooth, quietly operating pump system. Over the years Schweiss factory engineers rolled together customer comments, combined with high-tech design knowledge and experience to come out with perfection in a compact pump unit ready to be mounted anywhere you want it. WHY WOULD ANYONE USE WOOD ON A MOVING DOORFRAME ? Did you buy an all-steel door? Did you expect to get wood on your steel door? Substituting wood in place of steel doesn't add structural value to the doorframe. It makes for a poor connection and weaker doorframe assembly. Wood may shrink over time and may split. 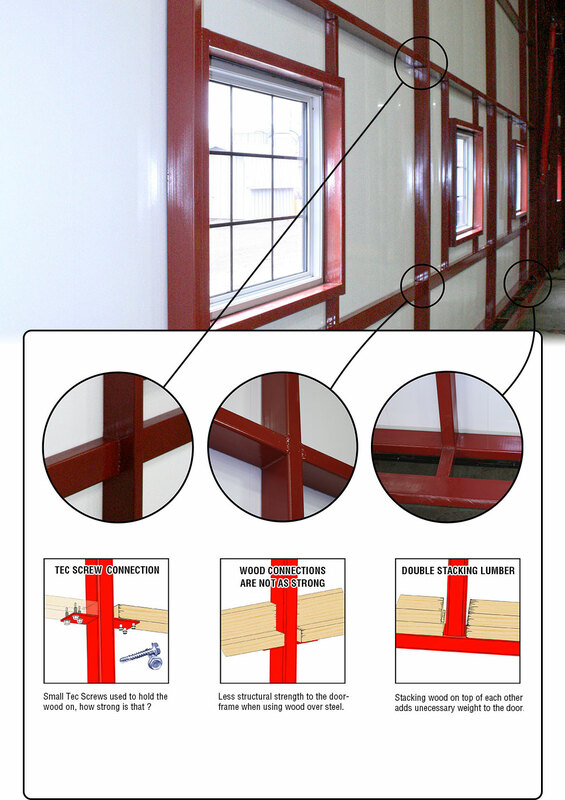 Tec screws used to fasten wood to the doorframe may wiggle loose over time weakening the connection. 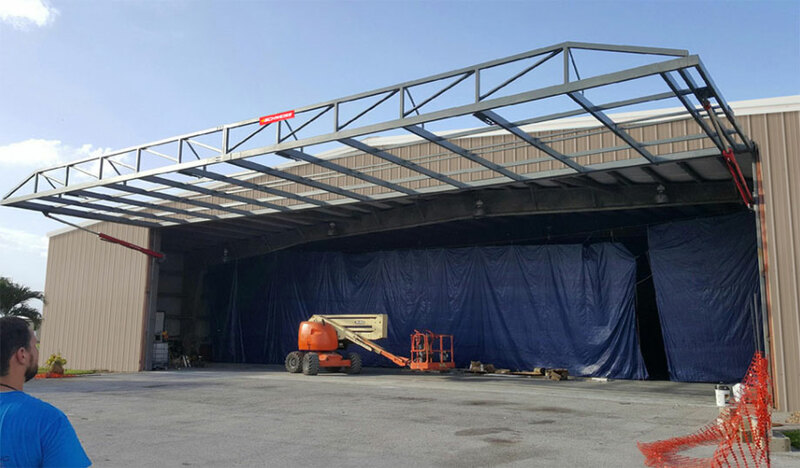 Hydraulic doors are large in size and just like an airplane wing, the doorframe flexes during operation. 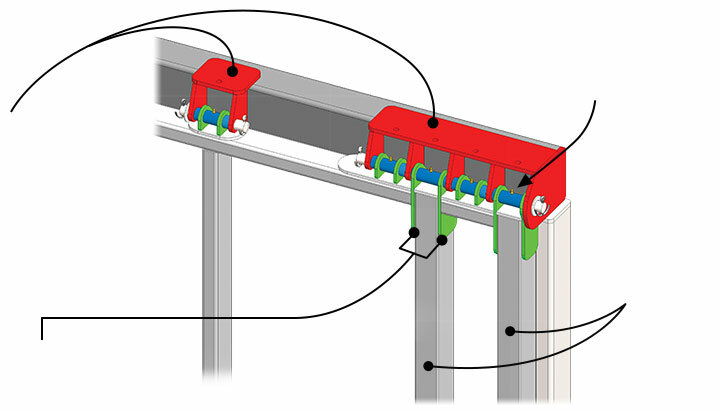 The hydraulic cylinders on each side of the doorway are connected to the doorframe and the building using spherical bearings. 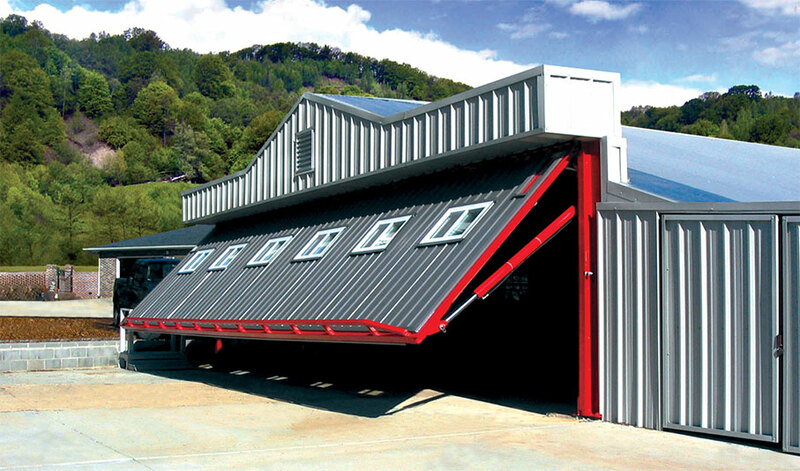 The spherical bearings accommodate the flexibility of the doorframe while at the same time allowing the cylinders to raise and lower the door without binding on the hydraulic cylinder pins and brackets. Spherical Bearings on both ends of the cylinder allow the cylinders to stay straight through the full range of motion. "Soon as I saw understood the spherical bearings design it was a no brainer. I was immediately SOLD on the Schweiss Hydraulic Door!" 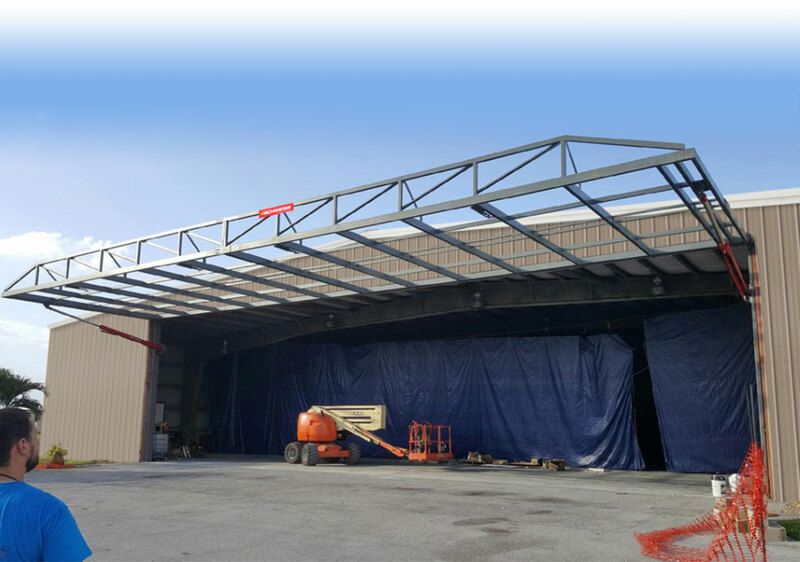 "OUR NEW WRAP-AROUND HINGE DESIGN SETS THE NEW STANDARD FOR HYDRAULIC DOORS"
Schweiss doorframes are designed with double push tubes that are tied directly into the wrap-around hinges that connect both vertical push tubes directly to the header tube. 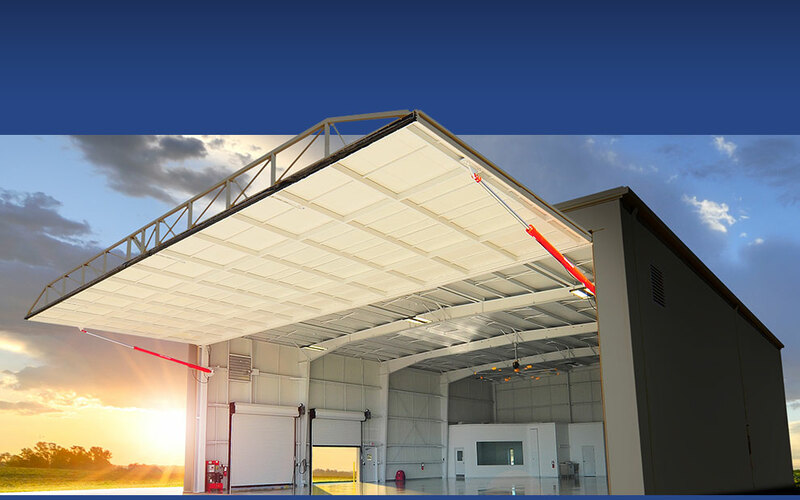 The advantage of double push tubes is that forces of hydraulic cylinders are evenly distributed to the doorframe and the wrap-around hinges. "There have been hydraulic doors with hinge welds that failed, literally tearing off the doorframe and destroying the door," Schweiss says. 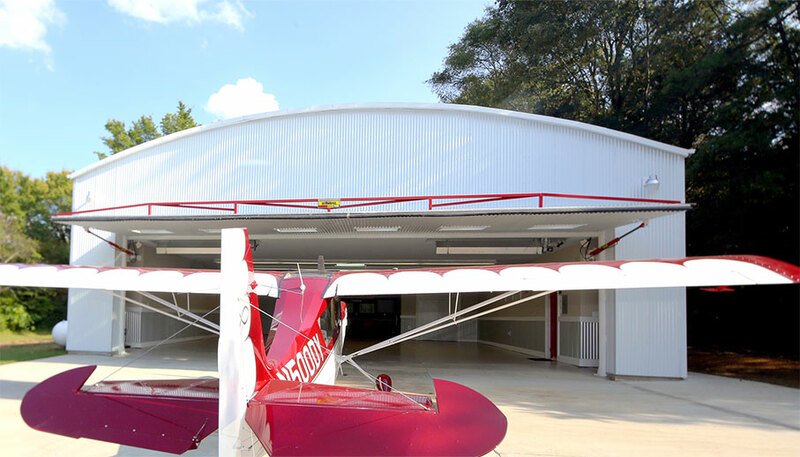 "Our design team provided a more durable wrap-around hinge with grease zerks that are accessible without removing the top rubber seal." THE STRONGEST HINGES ON THE MARKET! • "The hinges sold me." • "The Schweiss team hit a home run by putting grease zerks in their hinges." • "Now that's a Serious Hinge, You guys have it figured out!" • "Oh my, nothing comes close to it. Professionally done!" • "Nothing on the market will even come close to the Schweiss hinge design." Strongest doorframe on the market! 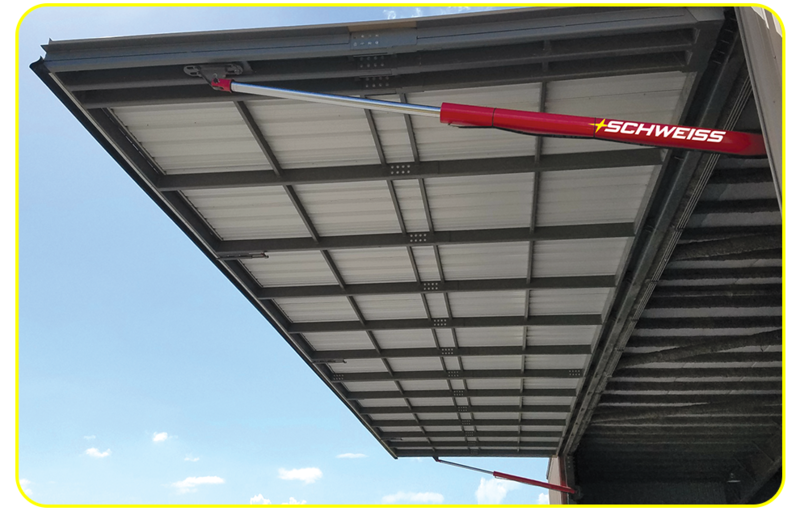 SCHWEISS is the only manufacturer to offer hinges that can be greased from underneath the door without removing the top weather seal. the surface,there is really . . .
. . . Standard on every door!
. . . Greasable hinges are not even an option with other manufacturers! The Schweiss hinge design is far superior to the competition. 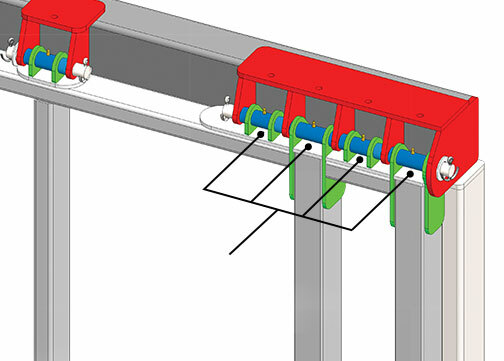 The Schweiss design, with the extra long pin, not only reduces the stresses in all the components of the hinge, but it spreads the forces on a narrow section of the door. The Schweiss design is so much more robust than the competition’s design. The hinge makes the door... so it had better be STRONG! 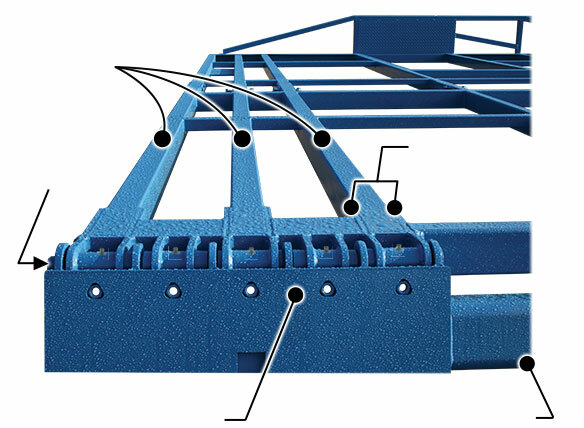 The unique hinge design incorporates heavy hinge plates that wrap around each vertical push tube for added rigidity. 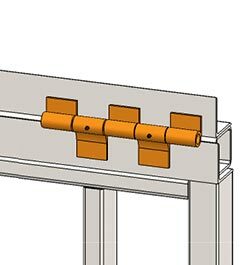 Without this wrap-around design, the doorframe members can be overstressed and begin to tear apart from door weight and hydraulic forces over time. This won’t happen with a Schweiss Door! 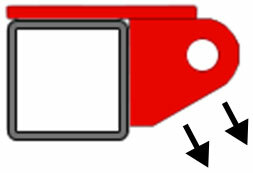 Hydraulic doors operate with one set of top hinges. 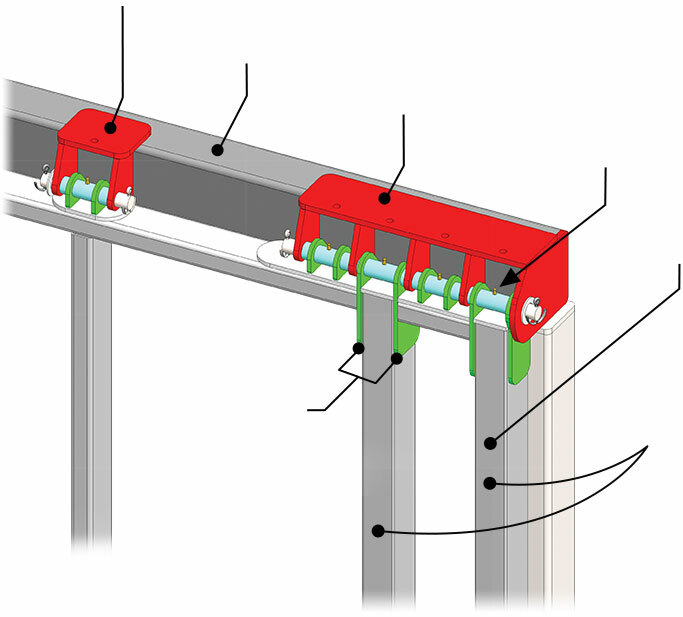 These hinges need to be strong enough to support the door weight and the hydraulic cylinder forces when opening; unlike a bifold door that shares the load between the top hinges and the center hinges. It’s all about surface area. 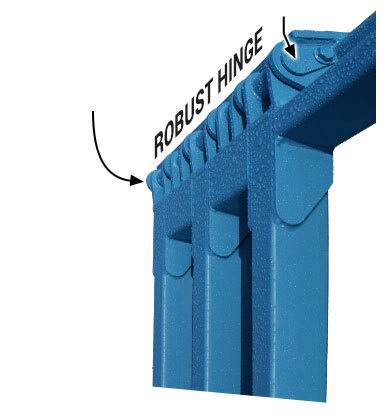 The more surface area you have in the hinge design, the lower the stresses will be in all the components. The Schweiss design has almost twelve times the surface area of the competition. It will far outlast the competition, no matter what size door. The Schweiss robust hinges are designed to withstand the door weights and hydraulic forces of the cylinders as the door opens. Your door is only as good as its hinges! Take one look at the Schweiss hinges and you will clearly see the workmanship, strength and functionality of each hinge. The Schweiss hinges are bigger... stronger... heavier. The competition uses thin-wall bushings that they claim are “no maintenance”. That is, until you have to replace them because they have worn through. 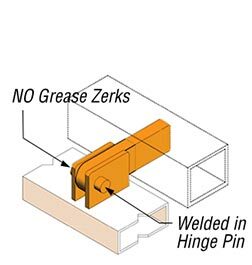 Schweiss hinges can be easily greased for longer hinge life. No Oilite bushings to wear thin. They are never welded in solid on a Schweiss door. All hinge pins are removable. This style hinge has been tried before and didn't hold up! You Usually get what you pay for! Only Gives you a "Cheap" Door!